Growing your own wheat in a home landscape can provide the grain you desire for flour. 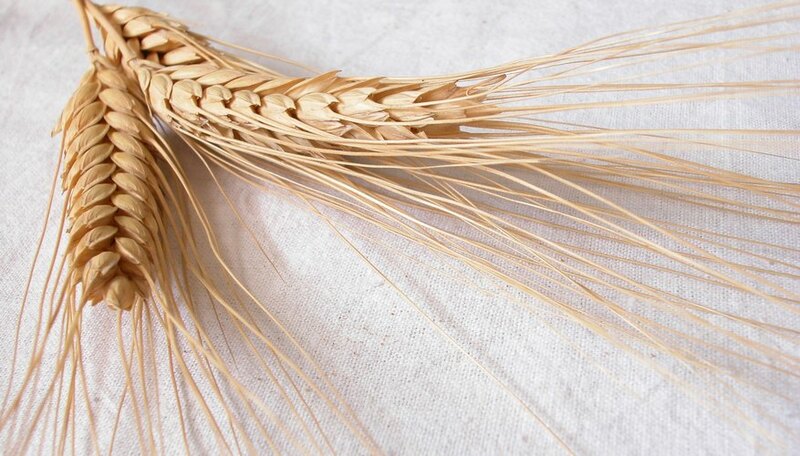 Growing wheat in a smaller production scale enables you to thresh and winnow manually. Threshing involves separating the wheat kernels from the stalks after you harvest them from the soil. After you thresh the wheat, you must winnow it. Winnowing involves separating the light chaff from the heavier wheat kernels. Thresh and winnow harvested wheat by hand to prepare homegrown wheat. Grasp a bunch of wheat stalks together -- enough stalks to hold in one hand easily. Tie the stalks together with twine to hold them securely. Hold the bundle in one hand inside the large trash can. Vigorously beat the bundle against the inside of the trash can to separate the wheat kernels from the stalks. Continue beating the wheat -- threshing it -- until no more kernels remain on the stalks. Throw away the stalks in either the trash or the compost pile. Transfer the wheat kernels to one clean bucket. Turn the fan onto low speed and position yourself with the two buckets in front of the fan. Slowly pour the wheat kernels from one bucket to the other bucket while the breeze from the fan blows on the wheat. As you pour, the breeze will blow away the chaff from the heavier wheat kernels. Pour the wheat between the two buckets two or three times until no more chaff remains mixed in with the wheat. If a natural breeze blows outside, perform the winnowing process outdoors where the breeze will blow the chaff away naturally.